Review: What’s So Great About Art Anyway? If teaching is an art form, then teaching art must be its masterpiece. 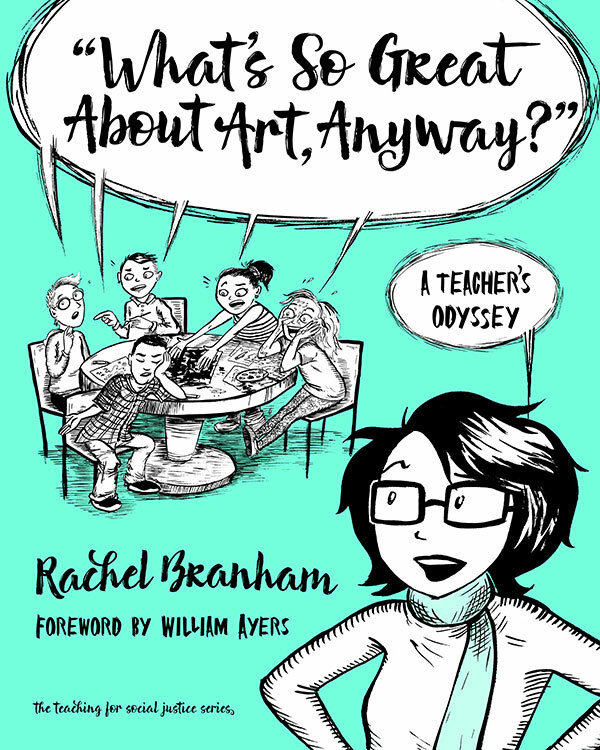 Rachel Branham makes a compelling case for the benefits of art education in her graphic memoir, What’s So Great About Art Anyway?. In ways that have both advantages and disadvantages, there are no right answers in art. Concepts like success and development are hard to quantify in the arts but childhood development has been studied extensively and the place of the arts in human growth is well documented in these pages. 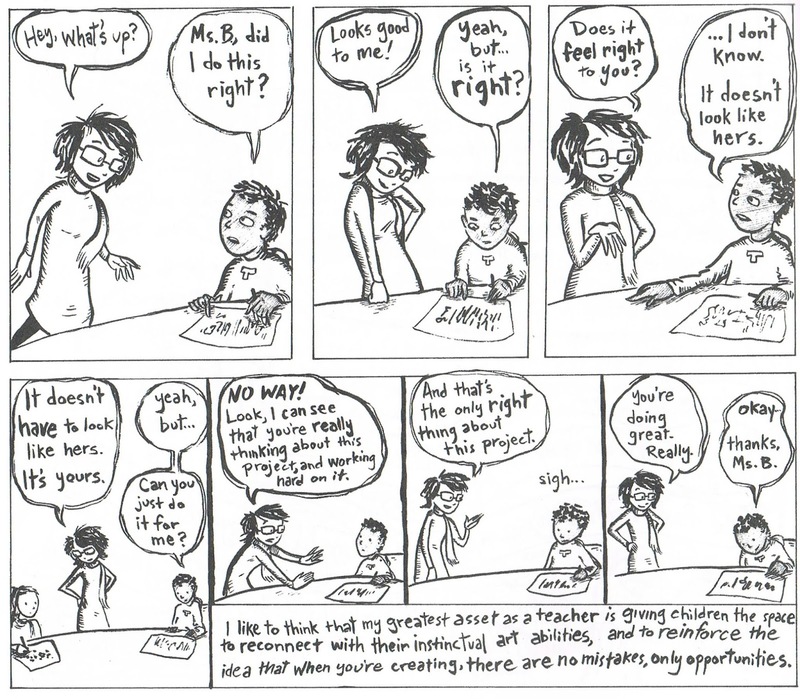 The section on cognitive science and Viktor Lowenfeld’s definition of developmental stages as reflected in children’s drawings, is fascinating and, due to Branham’s illustrations, fun to read. Although most of the book is devoted to art education, Branham also addresses education in general: its history, evolution, and place in society. While the value of good teachers is generally appreciated, support and understanding of their role in society is often overlooked. Recently, I attended to a wine-tasting party (think Tupperware party for drunks) where the rep from the winery was a teacher who, like 60% of American teachers, has a hard time making ends meet on that salary alone. Branham points out that in Finland “teachers’ wages are comparable to other prestigious occupations, like lawyers, doctors, and engineers” and that “there’s no shortage of teachers in countries who have invested in their training and ongoing support.” In America, teachers’ salaries have been declining since the 1990s and they now earn about 20% less than other college graduates who are similarly educated. The attrition rate of teachers in America is double that of countries like Finland, Singapore, or Canada. The elephant in this book’s room is our nation’s current civil cold war. Teachers are on the “liberal” side of this war just as cops are on the “conservative” side, regardless of the individual beliefs of members of those professions. As long as both houses of Congress, the White House, and most governorships and state legislatures, are in the hands of Republicans, teachers will be seen as the enemy. De-regulation of the private sector, removing oversight of police departments, and a steadfast refusal to even audit the Pentagon are will be offset by draconian federal government involvement in classrooms and wombs. Get your copy of What’s So Great About Art Anyway? from Teachers College Press, Amazon, or Barnes & Noble. And don’t forget to tip your bartender and waitstaff. They might be teachers.